The Fergus Scottish Festival and Highland Games has enjoyed tremendous success since its inception by Alex Robertson in 1946. The games have had two locations over the past 70 years, Victoria Park and more recently, the Centre Wellington Community Sportsplex (Fergus). The Games exemplify all things Scottish with a focus on heavy events, dancing, piping, clans and interactive family fun and community involvement. The Highland Games originated with the Ancient Celts in Ireland, thriving and evolving in the competitive environment of the clan structure of Scotland. It is commonly believed that in the 11th century, the Scottish King Malcome Canmore perpetuated the entire Games event with a race up a mountain. Like the ancient Greeks and Romans, it is not unreasonable to think that competition for strength, endurance and honour were ongoing adventures in all cultures. The concept of the celebrations of Highland Games evolved into a positive celebration of culture and history focusing on the most accomplished in each of the competitive fields, as well as the onlooker who enjoys the ambiance of cultural heritage. 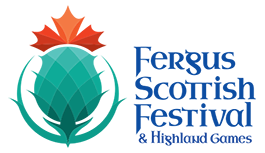 The Fergus Scottish Festival is pleased to participate in the promotion, presentation, and preservation of Scottish culture through good-natured competition and heritage education. Angela Cameron happily looks on as son Stuart and husband John Allan perform together at the Fergus Scottish Festival. Angela and Stuart have both taken on the role of Grand Chieftain after the death of John Allan Cameron. 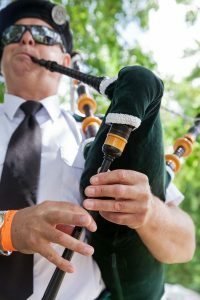 John Allan Cameron, the Godfather of Celtic music in Canada, served as the Chieftain of the Fergus Scottish Festival and Highland Games for 20 years and his son Stuart and wife Angela have also both graced us in the position. Born in Glencoe Station, Cape Breton, Nova Scotia, John Allan was a renowned musician who influenced Celtic music in Canada throughout his forty year of entertaining, who conquered the Grand Ole Opry in 1970, who mentored most of Canada’s Celtic musicians and who was named to the Order of Canada in 2003. One year at the Festival there was a lighting storm and as thunder and lightning filled the air, and the technical crew scrambled to dismantle the stage and the equipment (water and electricity do not go together) the word got out that the day’s lineup at the centre stage would be cancelled. “Nonsense,” thundered the Chieftain, resplendent in his kilt, his sword and his feathered hat, “the show must go on!” And go on it did. The Chieftain charmed (as only he could) an a cappella performance out of all the musicians who had gathered there that day. Those who were there to hear it still get chills as they recall the purity and beauty of the voices that united just as the skies began to clear. During his twenty year connection with Fergus there were always unscheduled parades at the Games, consisting of John Allan touring the grounds meeting people who remembered him from his television show, people who wanted to perhaps share a memory of his beloved Cape Breton, or people who wanted to congratulate him for his troubadour-like performances held spontaneously all over the site. 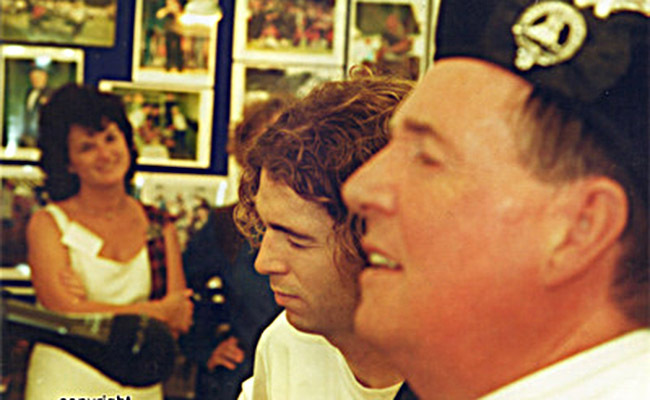 And always within the crowd of people following John Allan were at least a couple of musicians who wanted to thank him for popularizing Celtic music and influencing them in their own career. John Allan always seemed to be flattered and a little surprised by these accolades, but always warm and gracious. John Allan Cameron died on the 22nd November 2006 after a long and courageous struggle with cancer. The Fergus Scottish Festival lost a great Chieftain and friend. Every year in August we celebrate his musical legacy and generous spirit at the Games that he loved so much. Scottish people constitute a small portion of the world’s population yet their presence has been infinitely influential in the making of the modern world. More specifically, the history of Scotland presents a picture of oppression and survival far too common on the world stage. Yet Scotland and its people and culture survived, passing on traditions for the enjoyment of future generations. One of most distinguishing elements of Celtic and Scottish history is Clanship. Many Clans claim origination during the reign of the Celts whose Empire at its height stretched from Northern Ireland to the Steppes of Russia. The origins of the Clan systems modulate to include Celtic mythological beginnings. Clan Donald claimed progenitorship from both Conn, a King of Ulster ( second Century ) and the infamous Cuchulainn. The Campbell’s, on the other hand claim progenitorship from Diarmaid the Boar, while Clans like the MacGregors trace their roots to Gregor, the son of King Alpin who united Scotland in 843. The majority of Clans cannot trace their origins prior to the 11th century with most finding their roots in the thirteenth and fourteenth centuries. Social and political upheaval paved the way for a clan structure to succeed. The early battles between the Scots and the Norse in the 13th century and the numerous northern rebellions saw many war chiefs enter battle followed by their kinsman. The wars of Independence fought against the English in the 14th century encouraged Clanship as did the feudal tenures introduced to regulate the use and ownership of land. Clans were highly organized independent states living on one landmass. Unless united with other Clans to fight a common foe, they fought between Clans for reasons too numerous to mention here. Under Robert the Bruce, the Chiefs of Clans were given the right to dispense justice in addition to supporting the constant fight against English rule. Therefore the Clan system can be defined as “a product of local association, kinship and feudalism”. All of these elements were reinforced by Scottish law and further connected, in the Highlands by ties with the Gaelic language. The Battle of Culloden in 1746 and the horrors of The Act of Proscription saw the dismantling of the Highland way of life with the outlawing of the wearing of tartan, the playing of the pipes, the speaking of Gaelic, traditional worship and the dismantling of the intricate and complex organizations of the clan system. Additionally, the Agricultural Improvement Act witnessed sheep spread throughout the Highlands, gnawing away at the little that was left after Proscription. Proscription was lifted within fifty years and the connection between kin and Clan re-emerged. Despite what can be called a romanticism surrounding a great deal of Clan associations today, the elements that sustained clanship continue to be the ties that bind Scots to their past and secure them steadfastly in the present. Scottish immigration around the world results in Clanship followings on all continents. 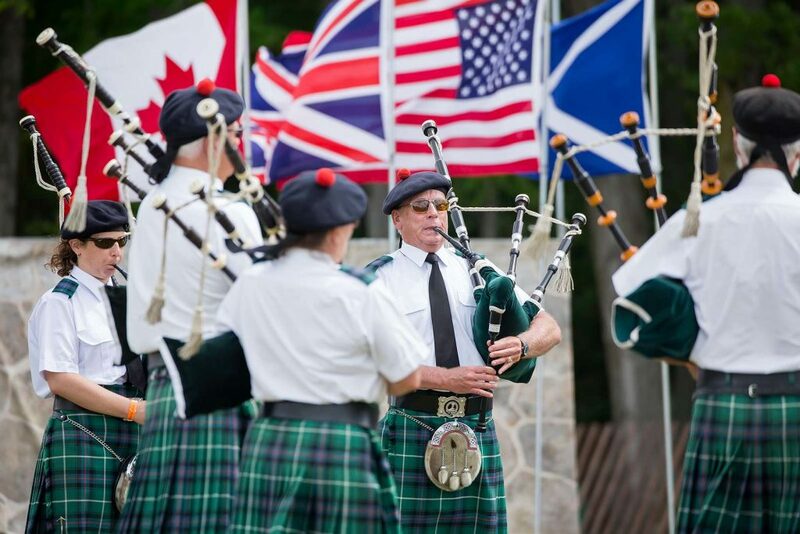 Festivals like the Fergus Scottish Festival and other such celebrations worldwide encourage participants to discover their roots and find the Clan to which their kinship evolved.